Turning our acceptance tests into a high added value deliverable. 2. Where can FitNesse be found? What are our tests but a witness to the integrity of our code? Just like what takes place in a justice court when a witness swears to tell the truth, all the truth and nothing but the truth, so are we doing the same through our tests. Sprint after sprint or iteration after iteration we ship tests along with our main software code components and we are in a way trying to convince whichever person of interest out there, that we are shipping the true (agreed upon) deliverable, all the true and nothing but the true. This observation applies not only to unit tests and other more technical tests but also in a very large part to acceptance tests as well. One may make the objection that we have such tools as Selenium or Cucumber for acceptance tests and that they are currently used to show case the team work in iteration reviews for example. But we cannot imagine a moment a PO running an Intellij or Eclipse IDE and looking into the code to find out how to rerun these awesome Selenium Tests. Suppose that she wants to run the acceptance tests using the newly deployed model calculator web service, there is no way she can do that unless a developer, a devop or an architect assist her. Suppose that she wants to run the acceptance tests against a different dataset (as she just received the last extracted anonymized snapshot dataset from a production server): she cannot do that unless she is assisted. These acceptance tests could also be used by her as a support artifact in an important internal decision meeting, but the level of confidentiality does not allow her to bring in an assisting engineer. To summarize it could be of great interest to provide the project's stakeholders with the ability to completely own the acceptance tests: that means to be able to access, customize and rerun the tests at will, without a mandatory assistance from the DOING team. The FitNesse framework provides this awesome feature as we will see soon. FitNesse is not limited to that though. Without no more delay, let's get into FitNesse. FitNesse is a test tool that comes in a form of a wiki web server, it is not hard to learn and as a wiki, it stands as an excellent collaborative tool for example between the DOING team and the business stakeholders. As a test tool each wiki page can be Test-Runnable or can be just an ordinary wiki page. This is very interesting because we can use it to directly test the specifications against the application itself. Since FitNesse is a wiki server, the requirements can be created and edited through the web browser. By writing specifications (or Acceptance Tests) we can create a common understanding among the team (developers and non-developers). The intermediation chain is therefore shortcut and the risk of wrong interpretations strongly reduced. The application becomes the direct interpreter of the specifications and the specifications become the unique validator of the code's correctness. The fitnesse.jar version which is meant to be integrated in your project via build tools like Maven or Ivy. In case you are already using the default port (as it is often the case) turn the former command into something similar to java -jar standalone-fitnesse.jar -p 9292 and the FitNesse wiki server will start on a different port. One can easily understand that a Division function is under test here and that the decision table provides both input values and expected results for the function, that is the function is being tested for correctness against many use cases. Since the fourth of a hundred is not 33, our test fails globally and the guilty line is highlighted in red and we also receive a global failure error message with corresponding statistics. Notice the question mark after the quotient column, this is how we tell FitNesse that it is the expected result column. Well to fix the test, simply edit the table as you would do any wiki table and write in the right value. Save your changes and test again. This time everything should be green (in case you did not notice it, the Edit link is right after the Test link). In such a simple case as this one, we may already have enough test datas, but what if we needed more input datas to test more cases? Again that is as simple as adding new lines into a wiki table.Let's assume for example that we want to check that our division function gives the right result for 141/3. Click again on the Edit link and add a new line at the end of the table that contains the values 141, 3 and 47.0 respectively, then save and Test again, you should have everything green again. You may add as much lines as you want to keep on testing the function, everthing should work like a charm. How does FitNesse functions under the hood? How are these decision tables made Test-Runnable? FitNesse works with two test systems, the Fit Acceptance Testing Framework and the SLIM Test System. The following picture describes how FitNesse works with Fit and SLIM. FIT (aka Framework for Integrated Testing) is the engine that processes the FitNesse tables. The test tables make reference to some corresponding 'Fixture Code'. FitNesse acts therefore as a Web client to the FIT engine and greatly facilitate the creation, the execution, the organization and the distribution of FIT tests accross the development team. As a FitNesse user, the work of FIT is completely hidden from our sight and we do not need to worry about it. As in the examples done above we can see that every table starts with a name that will be resolved as the classname of a Fixture Code that will interpret the rest of the table. The rest of the rows in a test table will depend on the style of table and fixture we are currently using: to each style corresponds a specific style of fixture code. Action Fixture: best used in order to emulate (via a script) a series of events (such as simulating a user navigating through the pages of a web site, like what can be done with Selenium or recorders of tools such as Gatling and JMeter). Comment Tables: allows the insertion of tabular comments that will not be executed as tests. Row Entry Fixture: an extension of the column fixture that allows processing rows of datas. Table Fixture: This style allows the creation of a completely customized test table format and also to process it in a customized fashion. Summary Fixture: This style allows the generation of a report of all the tests on the page. SLIM (Aka Simple List Invocation Method) is an alternative to FIT. 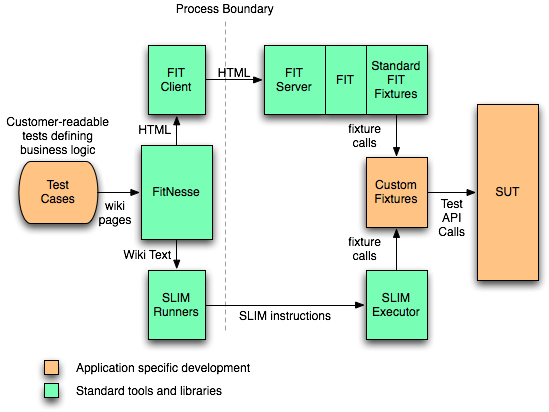 SLIM does not run all the HTML processing, the comparisons and the test result highlighting in the system under test but it keeps it in FitNesse. A very tiny kernel that implements the Slim protocol is executed in the SUT: this is simply a RPC system through which FitNesse can call the functions of the SUT. The SLIM protocol is simple enough to be ported on new platforms within a few hours of work. On the other side all the test tables remain consistent regardless of the platform of the SUT because all the features reside on the FitNesse side. In order to use the SLIM test one should set the TEST_SYSTEM variable to slim instead of fit. Baseline decision table: similar to a decision table but it is made more readable for big table as only the difference from one line to the baseline are specified. Dynamic decision table:this is similar to the decision table in its syntax but differs in its implementation because the columns headers are passed as parameters to the fixture's implementation. Hybrid decision table: it's a combination between the decision table and the dynamic decision table. Query table: similar to Fit row fixture it provides the expected results of a query. Comment: a table used to insert comments, otherwise it does nothing. To dig deeper into these SLIM tables checkout the SLIM Test System wiki entry in the FitNesse's user guide. So far we have played with FitNesse using the standalone version, now let's see how to integrate it in our project solution via maven pom's configuration. The maven dependency for FitNesse can be found in the central maven repository, at the time of this writing the last version is: 20180127 but you can use any latest version at the time of your reading. The command should work successfully, otherwise check for a typo or some similar issues. Now you should have, under the $FITNESSE_WITNESS_HOME folder, a sub-directory called fitnesse-witness. go into the fitnesse-witness directory and verify that the project was correctly generated by typing a mvn command, for example mvn clean install, you should get the classic echo of a successfull maven build goal. Now use your favorite editor to check your maven pom.xml file. It should look minimalistic with an old junit dependency version, you may keep that as is or better change it to a more recent junit version (such as version 4.12 or version 5.1.0, I am using 5.1.0 for this article). Let's consider the following scenario, which is used only for a demonstration purpose and is of course simplified as much as possible. As part of the core banking modules that we are implementing for our customer we are required to implement a loan calculator. The current specification is about the implementation of the calculation of interest using a model generator that depends on the amount of requested loan as well as the duration in months of the loan. We use java 8's BiFunction here to define a model generator that depends on two parameters: the amount and the duration in months. * Created by alompo on 06.05.18. We will assume, for the sake of simplicity that this implementation is good enough to go to the next phase of testing. Our goal is to ensure that this implementation is working just as expected. Therefore let's create a new wiki page to test it. First let's automate the FitNesse tests in our build process: there are many waysto do that but we will use the maven-antrun-plugin in this demo. So go ahead and add the following configuration to your pom.xml (you can use any port you want). Now that we have integrated the wiki into our build process, let's go ahead and create a test page. Ensure that the Page Type is defined as Test in the menu Tools => Properties. As you may notice also, we should tell FitNesse where to find our classes and even though the rendered text mentions the word classpath we do this by using the !path keyword. Of course we could add more test cases (with right or wrong expected values) and the FitNesse will tell the truth, only the truth and nothing but the truth. FitNesse comes with an awesome bunch of documentation that is directly accessible from the wiki itself. By going through that documentation we may see how powerful and versatil FitNesse is. We have seen how easy it is to manipulate, which makes it perfectly customisable and usable by any of our project stakeholders after it is deployed. FitNesse can be integrated easily with continuous integration tools such as Jenkins/Hudson and combined with Selenium, cucumber, JBehave and other similar tools. It can be totally administered from the frontend or via command line configurations. These aspects can be tackled in the next episode of our FitNesse saga. FitNesse User Guide: FitNesse Test Systems.